Allan Wendt was a junior FSO on night duty when the embassy was attacked by Viet Cong commandos. This is his story. 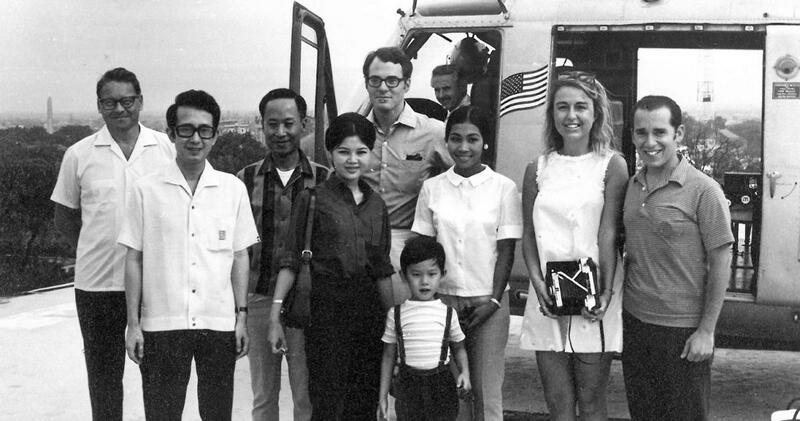 En route to Dalat, in front of an Air America helicopter circa 1969-70, from left to right: Bill Sharpe, USAID; Dang Co, Credit Commercial du Vietnam; Pham Kim Ngoc, Minister of Economy; wife of Dang Co, and son; Allan Wendt, Embassy Saigon; Showane Thach, USAID; Anne Henshaw, USAID legal adviser; Robert Starr, Embassy Saigon legal adviser. The fortress-like U.S. embassy in downtown Saigon was the citadel of the American presence in Vietnam during the Vietnam War. From this block-long concrete structure, under the direction of the courtly Ambassador Ellsworth Bunker, our 500,000-strong expeditionary force and huge civilian assistance program sought to roll back the communist tide. At 2:30 a.m. on Jan. 30, 1968, I lay asleep on a cot in Room 433 on the fourth floor of the embassy. I was a 32-year-old Foreign Service officer on my second overseas tour of duty and was just beginning my first week-long stint as night duty officer. Suddenly, the building was rocked by a loud explosion. Automatic weapons fire broke out, and rockets began to thud into the building. The embassy was under attack. As I soon learned, a 20-man Viet Cong commando squad had blown open the wall surrounding the embassy compound and poured into the courtyard. With this strike, the communists launched their famous Tet (Vietnamese lunar new year) Offensive. I quickly retreated into the more secure and better equipped communications room where a communications specialist, James A. Griffin, was on duty. A call to the ground-floor Marine security guard post revealed that at least one Marine guard, Sgt. Ronald W. Harper, was alive and functioning. The Viet Cong attackers, at that point, were not in the building. I took the elevator to the ground floor, where the situation looked bleak. There was considerable damage to the building and another Marine lay wounded and covered with blood. We managed to carry him up to a cot on the fourth floor, the one I had been sleeping on. I soon learned that in the initial attack, four military policemen and one Marine security guard had been killed. Despite an atmosphere of extreme tension, I found I was able to communicate with the outside world. From the fourth floor communications room, I placed and received innumerable telephone calls to and from the White House Situation Room, the State Department Operations Center (where I had previously worked) and the U.S. Military Assistance Command Center near Saigon’s Tan Son Nhut Airport. An American civilian telephone operator skillfully weeded out nuisance and nonessential calls. I spoke regularly to embassy officers at the offsite command post set up for Amb. Bunker. Civilian and military callers from near and far wanted to know the exact state of play. Were there any enemy fighters inside the building? How close could hovering helicopters get to the embassy roof (designed as a helipad), and how much ground fire were they drawing? At one point I just held up the phone so the caller could hear the rockets crashing into the building. As the siege wore on, we pleaded with the U.S. military command for relief. We were told an armored column was on its way. It never arrived. One helicopter finally managed to land on the roof and evacuate the wounded Marine, whom we had carried up to the helipad. The same chopper also off-loaded two cases of M-16 tracer ammunition, a move I assumed had some purpose I had not divined: there were no M-16s in the building. To my consternation I also discovered that two armed American military personnel, including a Marine whose presence on the roof I had not previously detected, took off in the helicopter—leaving the lone Marine on the ground floor and us few civilians to fend for ourselves. Almost six hours after the attack had begun, I went again to the roof and was greeted unexpectedly by a platoon of heavily armed paratroopers from the 82nd Airborne Division. They insisted their orders were to secure the embassy floor by floor, starting at the top, despite my assurances that there were no Viet Cong in the building. By the time they reached the ground floor, the shooting had stopped—18 of the Viet Cong sappers had been killed by military policemen, Marine guards and civilian security personnel firing into the compound, and two were taken prisoner. Dead bodies littered the compound. The commander of American forces in Vietnam, General William Westmoreland, arrived on the scene and advised me to have the embassy cleaned up and the employees back at work by noon. This was quite unrealistic. Fighting was raging all over the city. Around midmorning I finally drove home in my bullet-riddled car, which had been parked behind the embassy. The windshield had been shot away, but I could drive the vehicle— fortunately the rainy season was still a few months away. My superstitious housekeeper immediately insisted on destroying the blue shirt I had been wearing. It was covered with blood from the wounded Marine, and she thought it would bring bad luck. Only late in the day did I receive a call from the embassy informing me that, under the circumstances, I would be relieved of duty obligations for the remainder of the week. The attack on the embassy revealed our lack of military and civilian preparedness. It was also an intelligence failure. We were in the middle of a real war, but the war was supposed to be in the countryside and not in downtown Saigon. Actually, as I was to learn later, there had been ominous signs of impending trouble, but they were misjudged. As civilian duty officer, I was ill-prepared. I was given no useful intelligence. I had no training in the use of weapons or first aid. I was very lucky to have survived; the odds were against it. But a few good decisions saved us. At the first shot, a quick-thinking Marine at an adjoining building had dashed across the compound and closed the embassy’s thick wooden doors. The architecture of the building with its lattice-work concrete outer wall absorbed the rocket rounds fired into it. The Viet Cong sappers were not of World War II caliber and, fortunately for us, were hit by American and Vietnamese personnel firing down at them from adjoining rooftops. The embattled Marine on the ground floor, Sgt. Harper, and my colleague in communications, James Griffin, shared all the tasks and never flinched or failed throughout the ordeal. After the attack, the embassy's Marine security detail was increased by 50 percent—from two to three. I stayed in Vietnam for another 3 and 1/2 years, even though the tour of duty was only 18 months. The embassy, and Amb. Bunker himself, kept asking me to extend, and why not? I enjoyed my work and found the country fascinating, despite the war all around us. I believed at the time that we were on the right track in Vietnam. Pacification was working. The South Vietnamese economy was developing nicely. Militarily, we were beginning to prevail in the conflict—particularly after Creighton Abrams replaced William Westmoreland. The South Vietnamese military was beginning to hold its own and even win some major engagements. Unfortunately, however, it was too late. Congress had turned irrevocably against the war in spite of all the evidence that the situation was turning in our favor. Should the U.S. have entered the conflict in the first place? Given our reluctance to see it through, presumably not. Americans have little patience for indecisiveness and stalemate. The U.S. fought the war with serious limitations—such as not invading the North and eschewing strategic bombing of Hanoi and Haiphong until December 1972, just a few months before we withdrew our troops. This restraint stemmed from our fear of escalation, of bringing in China and the Soviet Union, whose intentions we misread. Yet there are historians who contend today that fighting the war in South Vietnam bought time for other countries in the region to achieve a degree of stability and prosperity. Was it worth 58,000 American lives? No, given the outcome. Was it a necessary war? Again, no, but historians will doubtless continue to study and debate the matter. Looking back, I recall that just about every FSO tapped to go to Vietnam went willingly and some even enthusiastically. Many served with distinction. The war was controversial, of course, and there was substantial opposition to it at home. With rare exceptions, the American press tended to report only bad news. Yet for a career FSO committed to serve anywhere in the world, Vietnam was the place to be. At the time, there was no greater calling. Allan Wendt, a retired FSO, served in Vietnam from 1967 to 1971. He also served in Düsseldorf, Brussels, Cairo and Washington, D.C. He retired in October 1995 after serving as the first U.S. ambassador to Slovenia, but returned to the State Department in 1999-2000 to work on Bosnia and Kosovo.